As ‘virtual ethnography’ has emerged, the possibilities of a genuine experience from the armchair have been, on some level, recovered. However, in ethnographies of online environments like Second Life (Boellstorff) and networked games like World of Warcraft and EverQuest (Nardi, Taylor), all participants presumably are operating from their armchairs (or office chairs, couches, etc). Over at Savage Minds, P. Kerim Friedman suggested that the spill over of our field sites through the Internet creates a kind of “database of lived experience” that offers perhaps some greater legitimacy to forms of remote ethnography. I recently embarked on a project with Janaki Srinivasan, a recent graduate of the ISchool PhD program. She is the lucky one who gets to actually do the fieldwork (on mobile phones and the fishing industry in Kerala, India). For me, it was an experiment to see how I might overcome my more limited opportunities to jet off for months or years. What I’m attempting though is not remote ethnography, something I’ve heard of before and that usually seems to entail data garnered through sites like Flickr, Facebook (i.e. to learn about pop culture in India). This is rather read-along ethnography. Janaki writes notes, snaps photos, and then they appear through the magic of Dropbox. I try gamely to keep up, reading the documents as they come in, in chronological order. So far I would describe this attempt as a failure (on my part). We’re up to week 9. The struggle has forced me to think about all of the ways knowledge of a place and the people living there just doesn’t carry over in the field notes. Week 1: Directories of photos are now appearing. Pages and pages of notes materialize. The first week is manageable. I read each page of notes. There are already some interesting surprises and questions. I even write comments on the notes and create a separate document with the questions. Week 2: It is already becoming an enormous task. I’m trying to read along, sequentially and trying to keep up to date on the most recent notes. Some of the earliest visits to fish markets and landing sites are also the most difficult to make sense of, full of questions and uncertainty. The fieldworker is going through her own struggle to make sense of what she sees (this is definitely reflected in the notes). My own struggle to comprehend is compounded from a distance. Without place, time, and people in my mind’s eye to anchor what I read, the notes unfold as a disjointed moment-by-moment record of half-conversations, interruptions, unexpected incidents observed and partially understood. What most seems to be lacking is a kind of temporal memory … of moving between spaces. In the notes, I have to maintain a heightened alertness to shifts in context. A movement between quite distant locations may be marked with a few words and only a couple of line breaks. I can get through the notes quickly, but lose the sense of stretches of time and the tempo of the work. Perhaps if there was some strategically placed white space in the documents to give a feeling of time passing? Week 3: The task of reading along feels very much beyond me now. And it’s only taken three weeks to get to this point of hopelessness. I am about to give up on reading-along. At four weeks (and counting) of notes, I stumble upon an Excel spreadsheet that Janaki has diligently kept documenting each day’s activities…a ray of hope, perhaps the data CAN be ordered. I rely more and more on our weekly phone calls from the field. We can create some sense and order out of the mass as we connect over Skype. The summary of the work Janaki provides (i.e. ways that different categories of people in the fishing industry use phones) proves to be a lot more graspable and memorable than the running list of incidents and instances. Week 5: Before another Skype call, I dig into the directories of photos willing my visual memory to play its part. I note the unusual, the bright. Patterns of fish laid out by size, men wearing patterned sarongs that come down to mid-thigh, a church (with a cross) but that looks very temple like. The people are not people I know, their faces do not register recall. I’m usually especially good with faces when I do fieldwork. I wonder how much of facial recognition has to do with other aspects of identity, the animation and expressions during speech, the tone and qualities of the voice. I sense a bit more how much of a role the visual plays in helping me with my own fieldwork. When I read my field notes, I can envision faces, settings, surroundings, I have a more expansive spatial sensibility. 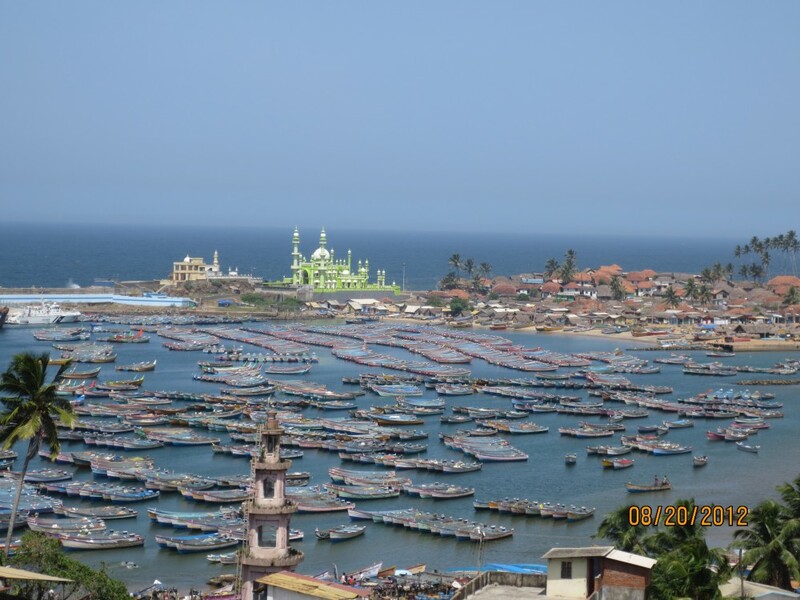 Looking at the photos, I cannot quite envision the layout of a fishing village. I cannot piece the sequence of photos together in a way that maps out the space. These still images, cropping out all but what fits in the rectangular frame, now seem quite limited. I see how much the recall from my own fieldwork photo archives stems from a memory of all that was just outside of the frame. A quick glimpse of one of my own fieldwork photos is able to dredge all this up again. I also lack a sense of location and distance between different villages. This, however, is easier to address. I visit Google Maps and spend some time working back and forth between the spreadsheet log focusing on the locations noted. I locate them on the map also eyeing relative distances between sites. The fieldwork, as I already know but now visualize more clearly, is being carried out in the southern tip of the state of Kerala. On one date, a trip to a fish market is logged and I am surprised to see that it appears well inland. Weeks 6 through 9: The pace of the semester quickly overwhelms plans to rededicate myself to the read-along enterprise. Doing actual fieldwork means not being around, often not being easy to contact (by phone or e-mail) or being able to use that credibly as an excuse. Reading-along doesn’t take that much time compared to the work of generating the notes in the first place. Text condenses the experience, in part because the logistical work and time in transit are omitted. Yet, the demands of teaching and other obligations make even this minimal time commitment difficult. In this imperfect process of read-along ethnography I certainly gained insight into how I relate to my own field notes. Memories are so much more effortlessly secured in the slow unfolding of multi-sensory experience. Field notes, no matter how carefully and diligently kept, are inevitably memory-jogs rather than complete inscriptions. Even great quantities of rich multi-media data (audio, visual, and text) are inevitably highly incomplete. Though the spread of the Internet to far flung corners of the world can overcome delays and distance making possible a practically synchronous connection to the field, there are still limits to the view from the armchair. ← Can Ethnography Save Enterprise Social Networking? While I can certainly understand the amount of richness lost when reading along, I wonder how much of the disorientation would be alleviated by knowing the fieldsite in detail. Certainly not all, but for example, if Janaki were doing fieldwork in Ghana or Uganda or perhaps even a nearby country with enough cultural and environmental similarities, you would have an enormous amount of context – place names, life rhythms, social structures – in which to situate the raw data stream. Even reading up in advance on the specifics of Kerala (more people than Ghana!) might reduce the context burden. Alternatively, one can construct much richer experience streams than you could easily rebuild from dropbox with the right equipment – richer in the sense that one can assemble sensory data (images, audio, video) into temporal and spatial streams instead of directories full of files and spreadsheets of coordinates. Criminal not to be using GPS cameras (or at least loggers) these days, imperfect as they are. Finally, it’s hard to engage passively with a field experience. One thing that I’ve encountered when I’ve tried following-along-remotely is that it’s far easier (for me) to remain engaged when I’m actively and continually trying to make sense of what’s going on, and as you say, talking over fieldnotes is much more fun than mere voyeurism. I think it helps (for engagement – probably not for the person in the field 🙂 if you’ve got more background about the site than the person in the field. The main points that need to be addressed when creating rules and regulations for research is: What level of regulation will be best to prevent abuse of research subjects, and what is the appropriate use of funds to ensure the benefit of the societies researched and the societies sponsoring it? Rules are essential for cooperative living in all groups. My position is that there should be an anthropological review board connected to or including the review boards in the U.S. and Canada that should enforce a set of common anthropological rules. Keeping in mind when reinforcing and introducing new rules, is more effective when it is a standard for all. To secure the authority of any rules there must not be a double standard. The rules then must be simple, enforceable, and applicable to all. Consequences of breaking those rules should be specified, reasonable and clear. When considering how much freedom these rules should allow, review boards should consider what they would want to be asked of themselves. If they were doing the research, what limitations would they want? How much regulation do they think they could handle, and still have enough freedom to be productive and efficient in their research goals? When establishing the rules that they would want to follow, they should consider what it would be like if everyone did the same. Do they like that picture? In all of the case studies I read, the main violation that I could see was leaving out the input of those being studied. There should be one general question: Did you make sure to ask?! Asking what the society might need, how much privacy they want, and what they would be agreeable to, should be the general rule! So, if there is a question of what is best, then just ask! Have an initial interview with the natives in a town meeting. Talk to the leaders and show them what you are looking for, and if it is acceptable to them. It didn’t seem like anyone in these case studies took that step very seriously. How much could have been avoided if the Yanomamos were asked what they wanted? Wouldn’t your code of ethics be slipping if you do not ask? What should happen if there is a question of the rules being broken? Then, the person in question of breaking the rules should then be held accountable for the laws of their own country and state, where they have citizenship or patronage; and in addition, also be held accountable for breaking any of the laws of the host society. The laws that can be broken (or committed) in the hosts’ society and the guests’ society will both be honored. The laws that license in the hosts society will trump the laws that license in the guests society. If there is a desire to be integrated as a part of the hosts’ society then the process of citizenship will be conditional and declared by the hosts’ society’s laws; and in doing so the anthropologist will lose citizenship of their original society. Marriage into a host society will automatically declare patronage and citizenship to that society. In such cases the anthropologist will also lose the representation of the anthropological society of their original country, and will only be a licensed representative of their new land of citizenship. If the rules broken are strictly against the anthropological society then the review boards of that society may revoke the anthropologist’s license. In conclusion, even though a reasonable degree of freedom needs to be available to an anthropologist to effectively accomplish the goals of their research, it should not be at the cost of the laws that they are accountable for. I believe that the anthropologists and the anthropological society review boards should be held accountable for the code of ethics set by the anthropological society, the laws of their own country and state, and the laws of the host’s society. If these rules and guidelines seem too strict; then considered what the anthropologists would do if they were guests in a neighbor’s home. They eat with them, sleep under their roofs, and are living in their society. I wouldn’t let just anyone into my home to study me if I didn’t know a little bit about the rules of their culture, if they plan to keep them, and whether they understand my rules and plan to keep them also.